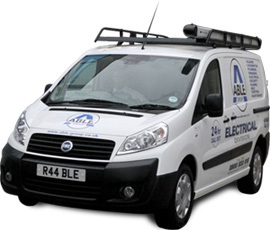 Able Electric specialise in the repair and installation of electric switches with fully qualified electricians available 24 hours a day seven days a week. When dealing with electrical equipment it often presents dangers and can even cause fatalities so it is always best left to professionals. Our 24 hour free phone customer support service will provide free quotes and estimates with any type of electric switch work. For domestic and commercial properties our electrical maintenance service is second to none with many happy customers throughout the UK.